Some offspring can be unusually thoughtless, cruel and manipulative, he says. Others can be charming experts at wheeling, dealing and exploiting their well-intentioned parents without any sense of guilt. And, many “problem” children are “uncaring,” lacking a sense of remorse for their perceived misconduct and misbehavior, Hoffman writes in the preface to the recently published 157-page paperback. The author, who has a full-time family therapy practice in Ormond and Daytona Beach, said he wrote the book to present a better understanding of “antisocial” behavior in children. The term “bad” in the title refers to children with varying degrees of difficult behavior. Throughout the book, the author refers to youngsters with specific behavioral challenges as “uncaring” children. “We have been taught to think that we are not providing proper care and love, that we lack listening skills and that our actions have possibly damaged or retarded our children’s normal development,” he writes. Those beliefs often result in parents feeling guilt and a sense of hopelessness in dealing with their unresponsive children, the author says. The author believes children often feel empowered by their parents’ extensive efforts to help them. “As long as children hold power positions in the family system, the youngsters maintain control over the atmosphere, directions, goals and plans of the family,” Hoffman said. Instead of being sympathetic and caring, the children take advantage of the situation by shifting the blame to their frustrated parents and, at the same time, demand more freedom and control, Hoffman said. “These children are masters of fixing the blame on parents, siblings, teacher and peers,” he wrote. *The chameleons: Capable of changing their dispositions and habits; they take on the personalities of others and copy their ideas and ideals. *The operators: Charming and ingratiating; experts at wheeling, dealing and conning parents and others; well-liked by their peers; relentlessly engage in deceptions for monetary gain. *The hellbenders: Take unnecessary risks and are accident-prone; accidents waiting to happen. *The transformers: Start out as the “good children,” but later becomes uncaring and disobedient. In the first two chapters, readers can get the impression that there’s no hope for their “uncaring child,” but, in the remaining seven chapters, the author guides frustrated parents through a series of helpful processes. “Bad Children Can Happen to Good Parents,” can be purchased online at Amazon.com. Norman E. Hoffman, Ph.D. of Ormond Beach, author of ‘Bad Children Can Happen to Good Parents,’ is a licensed marriage & family therapist and mental health counselor, as well as an accomplished jazz pianist. His first book, ‘Hear The Music! – A New Approach to Mental Health,’ followed his work at the nationally known Devereux Foundation in 1963, where he specialized as a music therapist for children. 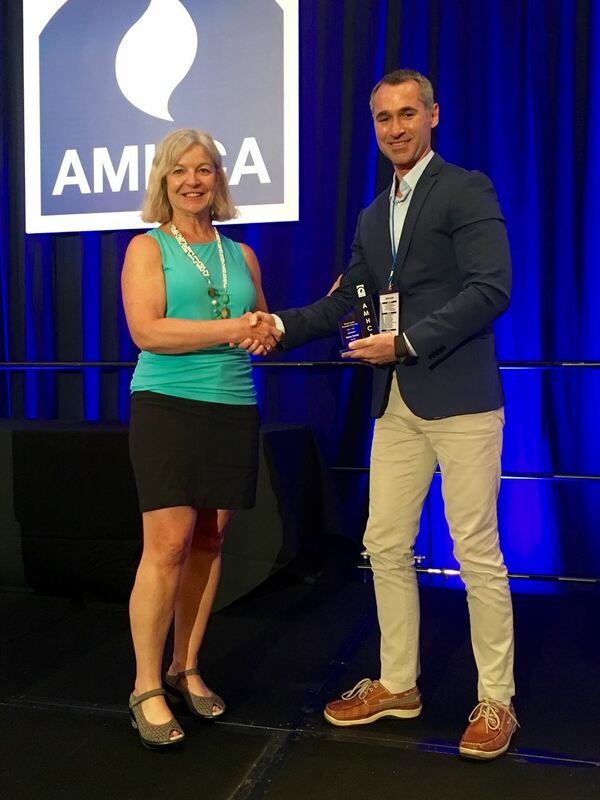 NBFE Executive Director Named AMHCA's "Mental Health Counselor of the Year"
Aaron Norton, a CFMHE and Executive Director of NBFE, was awarded "Mental Health Counselor of the Year" by the American Mental Health Counselors Association at last week's annual conference in New Orleans. He was a car salesman in Wyoming, Delaware when – after a high school friend was killed in Afghanistan – began intense social media discussions with those who falsely claimed affiliation with the Islamic State terrorist organization. What started out as a few naïve conversations turned into an obsessive flurry of communication that led him to quit his job, contact the FBI, and ultimately end up in jail facing charges and with his sanity in question. He went through multiple mental health evaluations before finally being released, based on a third evaluation done by Dr. Kirk Heilbrun, a Drexel psychologist that deemed Lopez mentally competent. While Lopez no longer faces charges -- he says the incident and evaluations involved have left him with a tarnished reputation and difficulty finding work. Forensic mental health evaluations are quite different from diagnostic mental health evaluations. Dr. Kirk Heilbrun says while the process has been refined over the years, there’s still room for improvement. The judge's decision that Jimmy Snuka is not competent to stand trial comes after expert testimony, mental health evaluations, testimony from Snuka himself as well as from his wife. Prosecutors wanted the judge to see things differently. 69 News sat down with Dr. Robert Gordon, an expert in forensic psychology, who says the issue of competency boils down to a simple principle. "Competency is understanding the procedures factually and rationally," Dr. Gordon said. Dr. Gordon also says, without expertise, it is difficult to detect whether the person in question is lying to avoid the charges, or is actually not competent to stand trial. He also says those who fake it, otherwise known as malingerers, are typically detectable to a seasoned professional. "Malingerers overdo it, they ascribe to too many symptoms that the real person wouldn't, or incongruent symptoms that don't go a long with the actual diagnosis," Dr. Gordon said. While it is over for now, there are still more hurdles for Snuka's attorneys to overcome. There's another hearing to evaluate any changes in Snuka's competency six months from now. Dr. Gordon says the outcome of that could depend on the reason Snuka has been deemed incompetent to stand trial. "[If the testing shows a psychosis], with the right medication and treatment, he could be rehabilitated and competent to stand trial," Dr. Gordon said. "If the neuro site testing shows brain damage, you can't restore those lost neurons and then he can't be rehabilitated and competent to stand trial." According to Snuka's attorney, after a year and a half the judge would have to dismiss the charges if there is no change in Snuka's competency.